of tools you're not going to believe! I promise, this will astound you! As someone who has the fire in your belly to succeed in life, you're constantly seeking new things to learn. That's why you received an education. And it's why you learn as much as you can about your job and career with the hopes that one day soon, you'll realize your dreams. But what if we have it backwards? What if your success is not as much dependent on what you learn but as on HOW YOU LEARN? You see, your brain is thirsting for a new way to learn. A better way to learn. Only then will you be able to double your learning speed and memory! You're about to discover (and in some cases, rediscover) the most powerful collection of learning tools available - tools that will give your brain its new way to learn - while it gives you a completely new outlook on life. More importantly, it's the first practical technology I'm familiar with that can actually make you smarter and allow your native genius to come forth. I've found a new system that can help you do just that with anything you wish to learn - significantly impacting your career, your relationships, and your MEGA bright future! It's called the MEGALearning System, developed by a highly creative educator named Donna Cercone. I've been using it for months now, and I'm blown away! I can't believe how easy learning can be or how much fun! Among other things, this program will teach you how to be your own brain mechanic. If you've ever had difficulty learning something new, had a problem with math, reading, memory, or creativity - you'll find out why and learn how to fix it. You'll discover your own programming needs - what colors, sounds, tones, and rhythms your brain needs to process information much faster. You'll learn about the mental and physical blockages that disrupt learning. And you'll learn how to open your mind to change and unwire blockages to a bright, new experience of mental clarity. Do you remember when school stopped being fun ... when you no longer had songs, color, imagination, rhythm, stories, or games to help you learn? It happens gradually, but by about fourth grade in the American learning system, we move from fun and games, color and imagination, songs and dancing, to drilling. "Drilling" - the word even sounds harsh! That's also when many students start falling behind. Whether you were one of them or not, you'll be surprised to discover why this time in life becomes a critical turning point for so many people. You see, the educational system we use today has been with us for hundreds of years and it was developed by people who had no idea how the human brain processes information. By learning the hard way - the way you've been taught since about fourth grade - you are completely defeating your brain's own natural genius and essentially weeding yourself out from the success and opportunity you deserve. Why trudge up a never-ending flight of stairs when there's an elevator that zips you to the brilliance and success you seek much quicker? MEGALearning is so effective that simply by using the system you can instantaneously improve your reading, listening, and memory skills by 100 percent or more. Today we know that each individual has a unique learning style. Some people are left-brain dominant, others are right-brain dominant, but all have one of five senses that is more dominant than the others ... and these differences work to create your personal learning style. Remember when learning was fun? Songs, color, imagination, rhythm, stories, games ... we love this stuff because our brains need it the way our bodies need water. Not just frivolous entertainment, this is the substance of memory - what the brain uses to sequence and process information. Donna Cercone, the inventor of MEGALearning, discovered that there are 12 different intelligences through which information can be linked to memory. This linkage builds neuropathways in your brain. These include vision, logic, body movement, music, and creativity. Nerve cells actually grow, change shape, and rewire throughout your life, and these intelligences are the tools that encourage growth and interconnection. The brain can continue growing and rewiring itself at any age, continuing as long as you keep learning. Using the MEGALearning System, Donna Cercone can show you how easy it is "rewire" yourself for genius-level concentration, memory, and comprehension. What Colors Will Open Your Mind to New Information? As a MEGALearning user, you will be among the vanguard of learners who are using color to increase learning efficiency! The power of color has been understood by psychologists for some time, but the MEGALearning System is the FIRST to introduce it in a home-learning course. Using 20 colored-filter gels you'll receive FREE with the MEGALearning System, you'll conduct your own learning experiments to discover how your brain reacts to different colors. In terms of making new connections, color is like the electricity of the brain. Color can open up long-term memory, stimulate the mind, moderate mood and feeling, and increase learning speed and comprehension. Simply by reading information through a new color, you can experience phenomenal increases in speed and comprehension. Remember the alphabet song? All you did was add tone, and you could memorize 26 distinct characters and their order. Color can have the same magical effect on memory as tone! However, your personal reaction to certain colors will be unique. In the MEGALearning System, you'll follow a procedure to help you find your optimal learning colors that will open up you mind to genius-level learning. In Cercone's own experience working with students, she has seen amazing results - including seeing people with learning disabilities suddenly overcome them - simply by changing the colored filter they were reading through. "I hate to admit it, but anything I read through the color I chose, I remembered far, far, better than when I read without using color." Why is MEGALearning so enjoyable? Because it is natural, like play, and it takes into account what your brain wants to do, not what it has to do. It programs information in a way that your brain is structured to accept it. The system is based on Cercone's own years of experience in classrooms, from her ongoing experimentation with these unique learning methods, and from the latest breakthroughs in brain research. Now she has formulated her system so that you can learn it for yourself in 14 short, fun, and easy self-study lessons. This is a program for everyone who wants to be smarter, happier, and more successful in life! How about you? Imagine what you could accomplish by cutting your learning time in half and doubling your retention. What could this do for your career? Or your children's grades and self-esteem? - You don't have to be creative. - You don't need a good memory. - You don't have to be good at math or a good reader. All you need is an average human brain. After using this program, you'll have the rest! Cercone has developed an incredibly easy system for anyone of any ability or age to learn. It's a step-by-step self-study program that works even if you don't work hard at it. - Make yourself a top performer! - Always have facts and figures at the tip of your mental fingertips. - Never be at a loss for an important client's name. remembering and comprehending much more than ever before. What's more, if you're already a rocket scientist, you can use MEGALearning to become the next Einstein. MEGALearning will help anyone think smarter. Are you ready for higher achievements? The writer George Eliot - another genius - once said, "It is never too late to be what you might have been." If only you were smarter, what might you have been? What is still left to be done? How Does MEGALearning Work for You? First of all, you'll discover the 12 intelligences, and you'll learn to link them to quickly, accurately, and efficiently record knowledge into your memory. You'll employ unconventional wisdom, use new tools such as color, music, coordination exercises, and guided visualizations. You'll learn how to change your environment to engage all of your senses in the learning process. You'll release your childlike brain that used to soak up knowledge like a sponge. Remember that six-year-old "you" who learned the alphabet so easily? Believe me, you've still got it! And all of this is just the beginning ... Cercone has synthesized the most comprehensive program of brain development exercises and learning techniques available. And they are all designed toward one goal: to help you develop and utilize a learning style that is individually customized to bring out the genius in you. Knowledge on our planet is doubling every few years. Alan Greenspan has said that the continued expansion of our economy relies solely on the productivity gains of American workers. Continual learning is no longer just a pathway to advancement, it is a necessity just to stay employed. Donna Cercone and her MEGALearning System have truly revolutionized the learning process at a moment in history when we need it more than ever. Dramatically boost confidence and self-esteem ... and much, much more! - 20 colored filter gels to find your own optimal learning light! The BONUS CD - Higher Test Scores- will teach you skills for studying and taking notes that will dramatically boost test scores and cut studying time in half. Plus, you'll learn a guided visualization that you can use anytime to access your genius mind instantly no matter where you are or what you are doing. I want to create a smarter world, so I'm using the program on myself as well as making it available to my best customers at genius-level pricing ... how about you? Can we help make you smarter, too? P.S. When you start using MEGALearning techniques in every area of your life, people will think you're becoming a genius ... and they'll be right! You will be learning to think like one! Order Now! I want to double my learning speed and memory PLUS be able to read and comprehend many times faster than I can today. 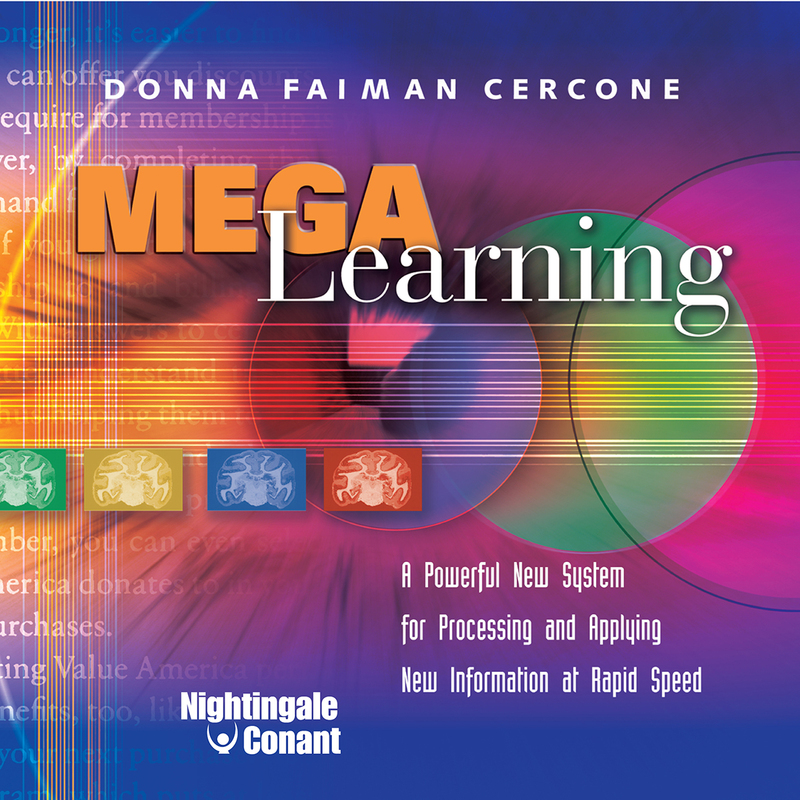 Please send me Donna Faiman Cercone's audio program MEGALearning, at the special price below. - I can select one of two ways of ordering.